With Maria still unable to wake Nagi from slumber, Hina, Ayumu, Miki, Risa, and Izumi are at the family restaurant when Ruka shows up. She recounts how that during a commercial shoot, she accidentally ran over Hayate on her bicycle. Thus, she took his butler uniform to have it cleaned and repaired, but lent him one of her idol costumes instead. She knows of Hayate’s kissing quest thanks to the dream, so she’s willing to kiss him. 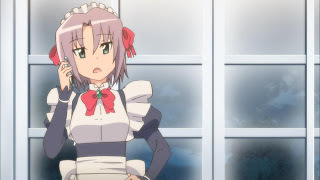 She’s prevented by Kayura, dressed in a boy’s school uniform, who cites how idols are like gods to their fans, thus an idol cannot kiss Hayate nor anyone else. As Ruka recounts this, Kayura shows up at the restaurant, where’s she’s eager to tell why she’s in a boy’s uniform. Hayate had called Chiharu, who’s stuck working at Sakuya’s house while Sakuya is out with Isumi, so he’s expecting to meet her at the park. Hayate swings by Yukari-chan House where Ah-tan realizes he’s in trouble and offers to kiss Hayate. Hayate goes for it, but Father Radiostar stops them, citing the criminality of such an act. 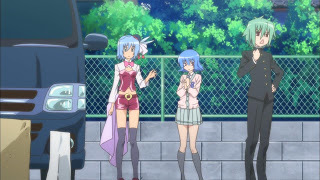 Ah-tan gets irritated by Father Radiostar’s diatribe and Tasers him and Hayate. Hayate races to the park, but Chiharu still can’t get free. In desperation, he finds Yukiji-sensei passed out. He tries to kiss her, but she then wakes up, challenging him to a fight. 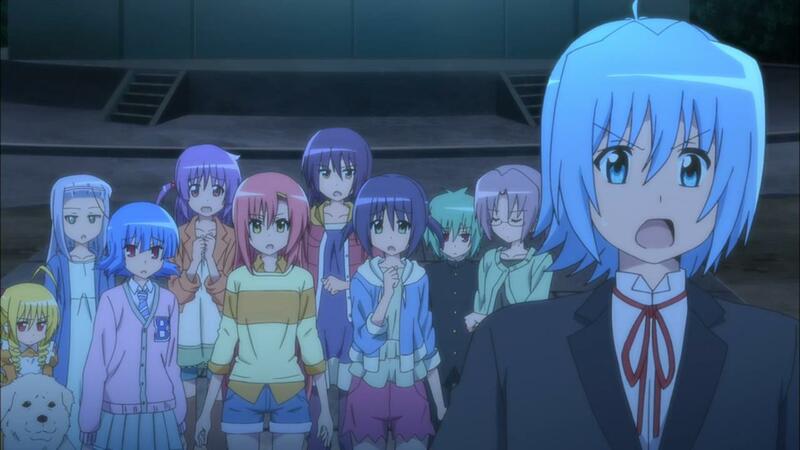 The battle rages until Hayate finally defeats her when the sake takes over. 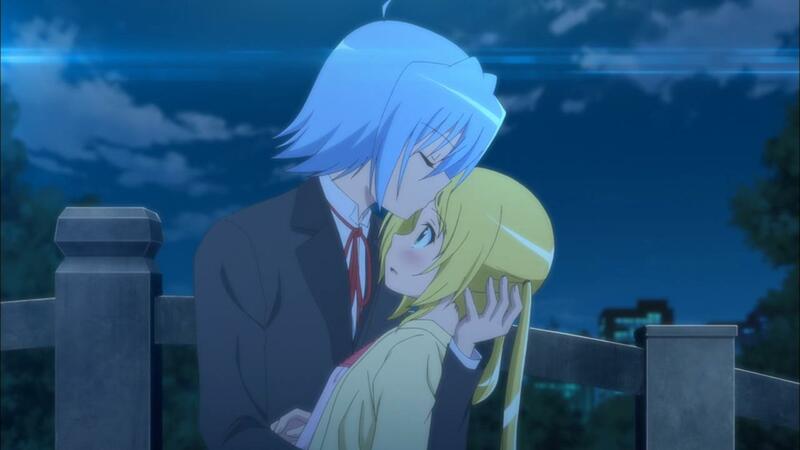 However, Kaoru-sensei arriving prevents Hayate from kissing her. Time is running out, so Hina, Ayumu, Ruka, Kayura, Izumi, Miki, and Risa head to the park. They meet Chiharu on the way, then ask him whom he will kiss. 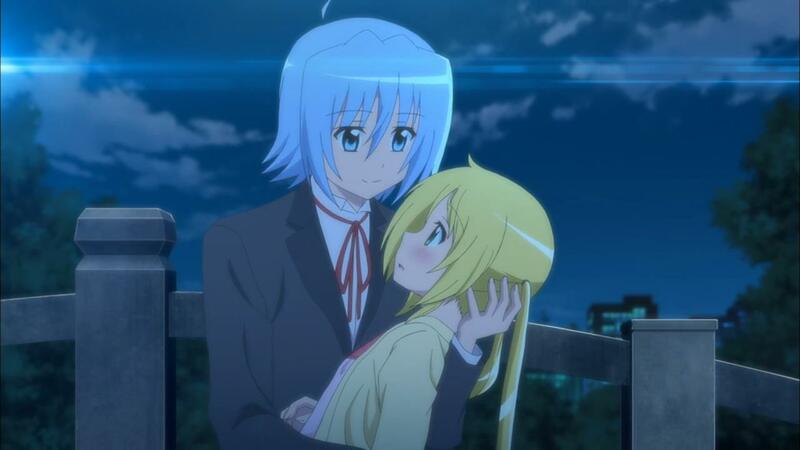 Inside the Kuro-tsubaki dreamworld, Nagi finishes her game and notices what is going on with Hayate. As such, she wakes up and is escorted to the park by Maria. 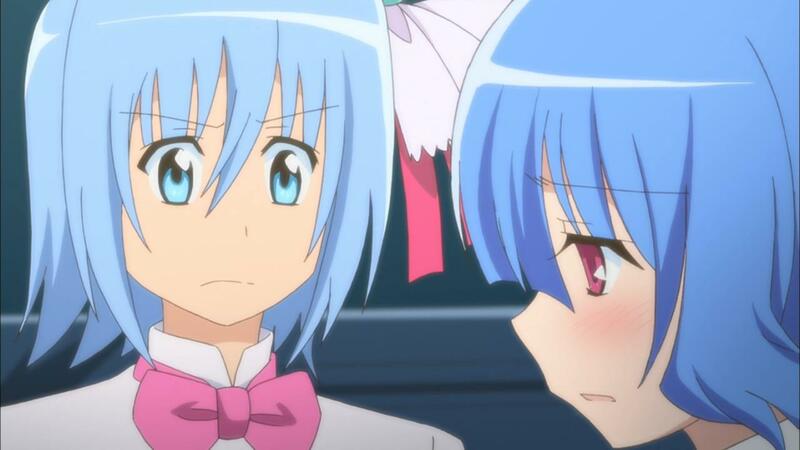 Nagi tells Hayate that he doesn’t have to go to these lengths for her before passing out. As Tanuki and Kuro-tsubaki watch, Hayate kisses Nagi on the forehead, waking her from slumber. The girls can’t believe that kind of kiss was all it took. Tanuki turns into Nagi’s mother, Yukariko, while Kuro-tsubaki turns into Nagi’s father, Shin. Knowing Nagi is in good hands, the two disappear while Hayate returns to being Nagi’s butler. Again, we get that LOVELY jump down, turn around, pick a scene at random to tell this tale. That doesn’t work for me, but at least there were some funny bits in this episode. 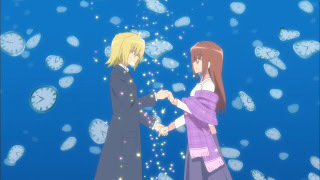 I didn’t think about it when I watched episode 11, but afterward, I got to thinking, “Well if Hayate has to kiss someone, then isn’t the Snow White effect in place?” Sure enough, that ended up being the solution to the problem, though only a kiss to the forehead. I should have figured that Tanuki and Kuro-tsubaki were actually representations of Shin and Yukariko. I figured they’d show up, but whatever. So, what worked for this episode? 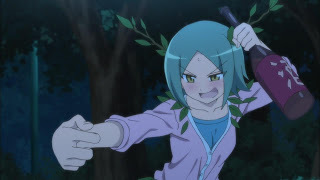 Well, I admit that the drunken Yukiji battling Hayate struck me as funny for some reason. Hayate and Father Radiostar getting tased struck me as funny too. Actually, Father Radiostar’s diatribe came off as funny to me. Because of recent idol scandals in Japan, Kayura’s rant on why an idol can kiss a guy struck me as rather droll. Still, this series was annoying as all get out. Ideally, I would have preferred to have Hata-sensei unpublished stories about each of the girl. Barring that, then I would have preferred a party setting with all of the Hayate characters, where each episode has them recalling stuff about one of the characters. That way, it could be set after CTMYOY without clashing. As it stands now, the forced attempt to make previous chapters fit after the fact fails because it makes no sense for Nagi to sometimes live in the mansion and sometimes slum it at Yukari-chan House. It is a shame to see one of my favorite franchises done this way, but whatever. It is over now and I’ll won’t watch again. I’ll keep reading the manga and if there’s a new anime series, I’ll probably give it a look see. So it took Nagi finishing the game to finally notice what’s going on? Well, when one gets caught up in a game that much (and I recall those days from my youth), one tends to lose oneself in said game. So Hayate wanted to kiss someone on the forehead? It looked like he almost kiss Ruka and A-tan by the lips. Yeah, it did. Just part of the “Ha!Ha!” element of the story, eh? If cuties is a sequel to can’t take my eyes off you then where was A-tan? She didn’t appear at all in can’t take my eyes off you. I watch this anime series while keeping in mind not to expect much of it. Thanks to that I wasnt annoyed or happy at the end. Anyway what are you going to watch next? My suggestion is The world gods only knows seeing it gets a 3rd season this summer and its published in Sunday too (Seeing that you liked negima and hayate the combat butler its the same harem comedy with a nice twists and story) Hehe, looks like I am slightly implying that I want astroboy to blog about my favorite manga. 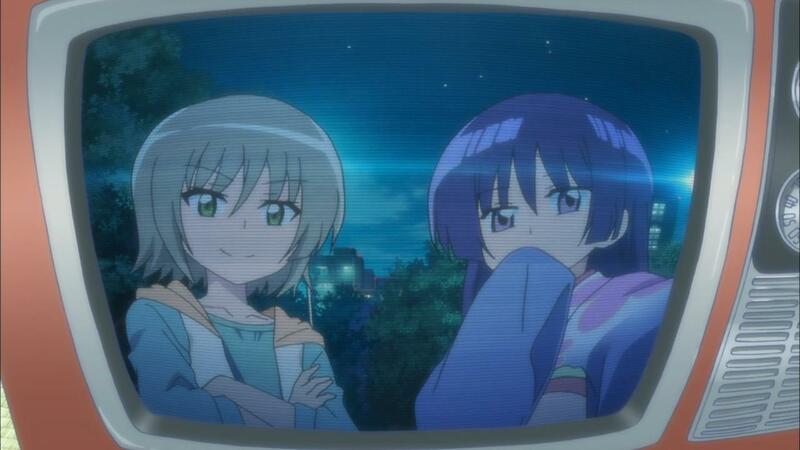 I don’t get why Kayura doesn’t want Hayate to kiss Ruka. Unless she thinks Ruka’s reputation as an idol will be ruined. The idol culture in Japan is a very strict one. Idols are expected to be as pure as the wind driven snow. They have contracts that state they can’t have a boyfriend or the like. That’s why when an idol gets caught with a guy, it is a huge scandal. That’s what Kayura is referencing. Yeah, I still love the manga too. It is a shame that Viz doesn’t release the volumes more often and that more people don’t buy it.